- Publisher Exploring the Bible's message is easy and exciting with these complete do-it-yourself Bible study guides. Each study includes helpful outlines, charts, maps, diagrams and explanations. For personal, group or classroom use. In this Self-Study Guide you'll not only learn about the history of the kings of Israel and Judah but also the purpose for the Chronicles, which served as a concise history of all that God had provided for the nation Israel. The book of 1 Kings not only traces the history of Israel's kings from Saul to Ahaziah but shows clearly that success results from obedience to God's laws. In 1 Chronicles, Ezra compiles the historical events that emphasize the importance of every aspect of Jewish heritage and purpose. An understanding of racial and religious purity, the Temple, the priesthood, and the law can be gained as you study these carefully preserved records. The books in the Jensen Bible Self-Study Guide series are designed to provide you with a broader understanding of God's Word. Offering historical context and background, author information, charts, and other helps, these books will equip you with a comprehensive reference tool you'll return to often. Each study includes an opportunity for analysis, response, and further study in a response-oriented format. The thirty-nine books in this series are suitable for both personal and group use. 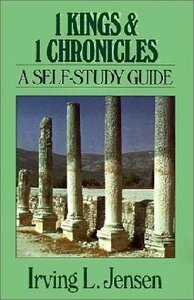 About "Self Study Guide 1 Kings & 1 Chronicles (Self-study Guide Series)"
Exploring the Bible's message is easy and exciting with these complete do-it-yourself Bible study guides. Each study includes helpful outlines, charts, maps, diagrams and explanations. For personal, group or classroom use.